Sold in March 2015, the 34.14 metre sailing yacht Signe is back on the market, listed for sale by Dolphin Yachts in Spain. Built in epoxy planked mahogany by US yard Renaissance Yachts to a design by Bruce King, Signe was delivered in 1990 after five years in build with several refits and upgrades since, including one in 2009 and new topsides paint in 2015. Sadly, the Renaissance yard is no more but Signe continues to pay tribute to the exquisite woodworking skills of the yard’s craftsmen. Her interior by Joseph Artese has joinery and bulkhead facings in varnished Hawaiian koa wood, with occasional use of olive wood plus bird’s eye maple on the horizontal surfaces. Accommodation is for six guests in three cabins consisting of an aft full beam master suite flooded by light through a large bevelled glass skylight, a starboard twin cabin and a port double, all with en suite shower facilities. The saloon of this yacht for sale is beautifully finished with many exquisite small details. Natural light and ventilation are provided by the magnificent 5 foot diameter bevelled glass skylight and other opening portlights, hatches and deck prisms. Aft is a bar area with a sink, ice maker and a cabinet for crystal storage while to starboard is an L-shaped settee comfortably seating twelve guests around a height adjustable koa wood table. At the centre cockpit helm position is a control panel to operate the hydraulic systems, bow and stern thruster, the engine and centre board controls*. *Signe boasts a luminous interior thanks to her 60 skylights, hatches, portlights, and prisms. She has stunning performance under sail with her powerful hydraulic rig, while under power a 450hp Detroit Diesel engine gives her a range of 1,800 nautical miles. 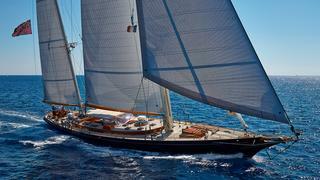 Arguably one of the most beautiful wooden sailing yachts ever built in the USA, Signe is asking €2,450,000 with VAT paid.